All right, I have a confession to make: I had never been to Hill-Stead Museum before Tuesday. Well, OK, that’s not true. I had been before to visit one of their weekly Farmer’s Markets. But I had never been inside the house, or taken a tour, or gone on one of their popular nature walks. I had never really seen first-hand what makes Hill-Stead such a wonderful place to visit. I heard through the grapevine (namely our Welcome Center Coordinator and frequent Hill-Stead visitor and volunteer, Susan Williams) that the museum was mounting an exhibit of rare and never-before-seen prints and sketches by Degas, Goya, William Nicholson and a number of original Japanese woodcuts purchased by the Pope family. And I thought, OK, this is my chance to go. And somewhere along the way (probably through the same Susan grapevine), Hill-Stead’s Director and CEO, the wonderful Sue Sturtevant, found out that I had never been out to Hill-Stead before and offered to give me my own private tour of the museum. I consider my self pretty “in the know” when it comes to the arts and heritage community of Greater Hartford, but even I held some misconceptions about the museum. For years I thought of Hill-Stead as simply a historic home—which it is, featuring some of the finest colonial revival architecture, landscape design and late 19th century furniture you’ll see here in central Connecticut. But Hill-Stead is also a nationally renowned art museum, featuring a collection of impressionist paintings and pieces by famous European masters that would rival any major gallery in the United States. In fact, Departures magazine named Hill-Stead one of the best small art museums in the country. Sue took me past the hordes of visiting students for my private tour through the museum’s latest exhibit, Wonders Revealed: Rarely Seen Original Prints from Hill-Stead’s Collection, featuring a stunning array of Degas studies and sculptures and some of the finest, most colorful Japanese woodblock prints I’d ever seen. And, unlike a “traditional” museum setting, you can view the exhibit as you travel through Theodate Pope Riddle’s meticulously preserved home—there’s the Degas bronzes in the library, the Nicholson prints upstairs in the hall and the Monet and Manet masterpieces adorning the parlor. I’m talking about fully furnished and decorated rooms here, not white walls and track lighting. It was amazing to imagine a time when these pricey paintings were owned by individuals who hung them above their mantlepieces and in the dining rooms in the same way I tack up IKEA prints in my one-bedroom apartment. Edgar Degas' "The Tub," hanging in a bedroom at Hill-Stead. Hill-Stead isn’t just a place where you go to see art, it’s where you go to appreciate it as well. Sue brought me into the downstairs bedroom and pointed out a particular painting, Degas’ The Tub, one in a series of paintings depicting a woman bathing. She told me that she runs a program with a local university where she invites medical students to sit on the rug and stare at the painting as they compose their own haiku poems about what they observe. “It’s about getting doctors-in-training to think about people and detach from all the science,” she explained. It gives the students a rare opportunity to see the world beyond the test tube and try to analyze and think about the patients they’ll be treating. “They’ve written some pretty amazing pieces” she confessed. Pretty cool, huh? One of the things I love about this job is the chance to escape the confines of the office and go out and see our arts organizations in action. I promised Sue I’d be back in the springtime, when the sunken garden is in full bloom and the grounds are full of thousands of colorful tulips. That will be a sight to see. Click here to learn more about Hill-Stead and their ongoing exhibition. Don’t miss it! We’re always trying to find a new way to engage people with the arts, and this year we’re piloting a number of new projects and programs designed to encourage people to get out and do something artistic (to take pART, if you will). Last Saturday, just days after Big Red for the Arts, we launched a new initiative: Arts Day 2012. Working with some of the local communities and municipalities in our 34-town service area, we declared Saturday, February 11, 2012 “Arts Day” in Hartford, Manchester, New Britain, Simsbury and West Hartford. Each of the town’s mayors and first selectmen issued an official proclamation (see below) confirming their town’s commitment to the arts. Arts Day also served as the kick-off of a really cool new public art project that we’ll be running through the spring in each of our 34 towns. Using supplies donated from Bic and Jerry’s Artarama in West Hartford, we’re asking each town to create a mural “mosaic” made up of index cards designed by members of the community. Each index card should represent arts, culture and heritage in each town. Cathy and a few of the staff (myself included) visited Simsbury and New Britain, where each town was hosting its own “Arts Day” event to jump-start the mural project. Special thanks to First Selectman Mary Glassman of Simsbury and Tim O’Brien, Mayor of New Britain, for welcoming us and reading aloud their proclamations—a public statement in support of our arts community. Our “Arts Day” backdrop in Simsbury was the children’s section of the local library, and dozens of kids from all over town joined Mary and Cathy in designing their own piece of the mural. In New Britain, we visited the downtown gallery/visitor’s center and met many of the local artists who live and work in special studios in the heart of the city. We got to browse and buy their hand-crafted pieces and join them in starting the mosaic project in New Britain. And this is just the beginning! Lauren Miller, Director of Cultural Advancement, and I will be reaching out to each community as they start their own murals, and posting pictures and stories here as the public art project evolves. Simsbury First Selectman Mary Glassman and CEO Cathy Malloy at Arts Day. CEO Cathy Malloy and Simsbury First Selectman Mary Glassman at Arts Day. Artists hard at work on their mural projects in New Britain. The Mayor of New Britain’s official Arts Day proclamation. Cathy creates her own “mosaic” piece at Arts Day in New Britain. Artist at work on Arts Day. CEO Cathy Malloy (center) and First Selectman Mary Glassman (right) help kids create their mural pieces. CEO Cathy Malloy, volunteer coordinator Anne Pilla and Mayor Tim O’Brien at New Britain’s Arts Day. Whew. I think the staff has finally recovered from hosting last Thursday night’s event: Big Red for the Arts, our annual food/wine/spirits tasting to benefit United Arts. For the last couple of years, Big Red has served as the official kick-off of the United Arts Campaign. Our biggest event of the year welcomed more than 300 guests to The Society Room in downtown Hartford to taste, try and test different dishes from the area’s best restaurants and more than 50 different spirits provided by Toast Wines by Taste in West Hartford Center. As you can probably tell from the pictures, the dress code is simple: the redder, the better! 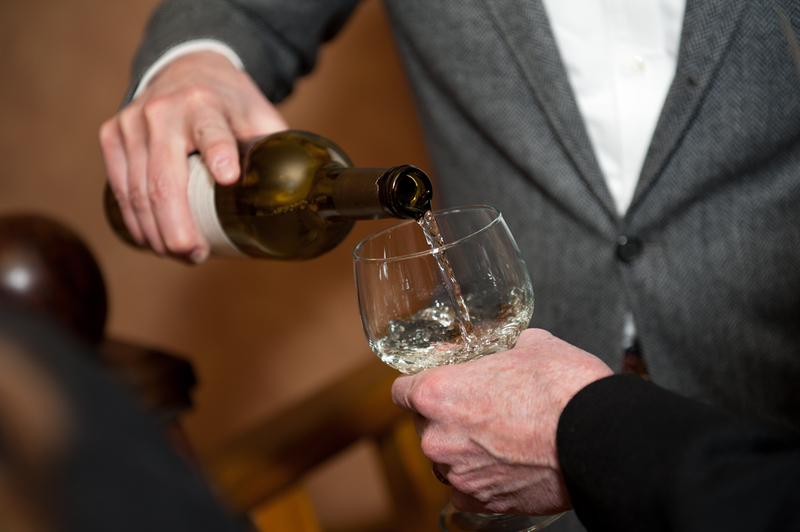 Benziger Family Winery pours a glass of its signature Savignon Blanc. The event is more than 10 years old, and every time-honored tradition could use a little facelift. This year, we added two new elements: a special VIP Pre-Party Premier Tasting and an on-site arts activity. For a little extra, local wine connoisseurs could join us an hour before the main event for an exclusive, high-end tasting of special wines. On-hand to greet the guests was Jerry Benziger of Benziger Family Winery, one of Sonoma’s most popular vineyards and a national leader in Biodynamic wine production. (Biodynamic is the new buzzword in sustainable winemaking—it’s a really cool concept that’s just started becoming popular. Check it out.) During the grand tasting, guests could chat with local artist Karen Israel and observe her expert technique as she created a one-of-a-kind painting inspired by Big Red during the event. Once it’s complete, we’ll post some pictures of the finished product. Big Red was a huge success. The energy at the event was electric—it’s wonderful to see so many business and community leaders mingling with arts enthusiasts, supporters and professionals. I particularly love catching-up with my friends and colleagues and getting everyone excited about this year’s campaign. Now that Big Red is over, it’s time for the real work to begin. Special kudos goes to Allison Young, our events manager, and the entire team for putting in a long day’s work to deliver a truly wonderful evening. 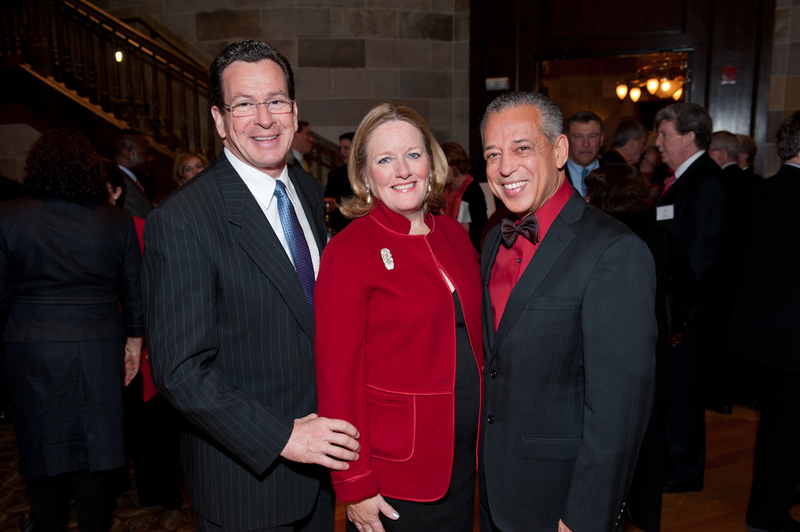 Governor Malloy, CEO Cathy Malloy and Hartford Mayor Pedro Segarra pose at Big Red. Sure, it’s about supporting and celebrating the arts, but I’m no idiot. It’s also great chance to try great food and dozens of different wines, beers and spirits from all around the world. At the end of the night, I noticed two new faces: a stylishly dressed young couple. Introducing myself (and complimenting the woman’s hot-pink pants), I asked what brought them to Big Red. Before her husband could even answer, the wife blurted out, “honestly, it’s all about the wine.” “And the arts,” he quickly added with a smile. See? There’s something for everyone. Check out event pictures on our Facebook page and photo slideshows from the Hartford Courant and CT.com, the new online home of the Hartford Advocate. Sign-up for events notices on our web site to stay “in the know” about upcoming events. I would be remiss not to mention—and say a very special thank-you to—our friends at Hoffman Auto Group and First Niagara for sponsoring the event. We’re lucky to have such caring corporate partners who support the United Arts Campaign. Cathy Malloy, the Greater Hartford Arts Council’s new Chief Executive Officer, is a woman who has worn many hats: seasoned non-profit administrator, business and community leader and a passionate advocate of the arts. Born in Massachusetts, the youngest of six children, Cathy graduated from Boston College in 1977 and moved to Connecticut in 1983. She met her husband, Dannel, in college and the couple married in 1982. Cathy and Dan have three sons: Dannel, Ben and Sam. Cathy worked in the restaurant and hospitality industry for more than 20 years, opening 11 restaurants for a national chain, owning and operating her own neighborhood eatery and running a successful gourmet catering business. She caught the non-profit “bug” when she was hired as the Vice President of Development for the United Way of Greenwich and Stamford in 1996, and has remained steadfastly committed to the non-profit community ever since. For more than a decade, she served as the Executive Director of The Center for Sexual Assault Crisis Counseling and Education in Stamford, an organization that provides counseling and support for victims of sexual abuse. In her role, Cathy has been tireless in her pursuit of raising funds and caring for victims and their families; through her outreach efforts, she nearly doubled the number of male clients served by The Center, made education a critical component of the organization’s counseling services and raised awareness for vulnerable and under-served populations at risk for assault. Cathy and her family have been life-long arts enthusiasts. She has spent the last few months as CEO of the Arts Council familiarizing herself with the rich cultural community of Greater Hartford; she balances time in the office with weekly visits to arts and heritage organizations, scheduling meetings with business and municipal leaders and attending cultural events across the region. Cathy is constantly amazed by the staggering number of world-class arts organizations in central Connecticut and makes it her personal mission to raise awareness about the rich, vibrant cultural community in and around Hartford. Stay tuned for updates throughout the campaign as Cathy travels around Greater Hartford meeting with supporters, artists and community leaders. The Greater Hartford Arts Council’s got a brand-new blog. Since the arrival of our new CEO, Cathy Malloy, we’ve been asking: “what is our role in the arts community of Greater Hartford?” Are we just a funding agency? Should we focus on providing the best services and programs to artists and arts organizations? Do we connect the public with art all around them? But most importantly, we’re about raising awareness for the arts and acting as advocates (read: professional cheerleaders) for all of the wonderful, talented artists and world-class institutions here in central Connecticut. We’re a lucky community: our Chief Operating Officer, Rie Poirier-Campbell, likes to mention that there are more cultural organizations—museums, theatres, symphonies, studios and historic homes—than Dunkin’ Donuts within a mile of the capitol building. And today, that’s a thing of beauty. This brand-new blog is, most importantly, all about the arts. But along the way we’ll be talking about the United Arts Campaign, the wonderful work of our grantee organizations and how the arts have a big impact on our local economy. You’ll get to meet our fun-loving staff, hear first-hand reports and reviews of some of the best cultural events in the area and, hopefully, come to love our arts and heritage community just as much as we do. So welcome! Let’s get this pARTy started. This year, we invite you to take pART in United Arts! We run an annual United Arts Campaign from February to June, and our new campaign is about experiencing art all around you: from visiting the world-class cultural institutions around Greater Hartford to enrolling your family in a dance class, listening to music on your iPod or doodling at your desk, there are hundreds of ways to pARTicipate in the arts. It’s our job to help you find out how! The money we raise through our United Arts Campaign supports more than 150 different arts & heritage organizations across 34 towns in central Connecticut. Any gift of any size goes a long way to providing the funding our arts organizations desperately need to do what they do best: create exceptional programming that entertains, enlivens and inspires us all. Learn more about why our United Arts Campaign is so important. Look out for our “Face of the Arts” campaign featuring pictures of people taking pART in the arts every day: from community leaders to everyday donors, maybe you will be one of the “faces” of the arts in Greater Hartford. We’re programming a series of fun, interactive and (mostly) free community events to get you out of your offices and give you something ‘artsy’ to do in the evening. Feel like you’re stuck in your cubicle? We might be coming to an office near you! We host workplace giving events during the United Arts Campaign to connect employees (and employers) with the arts in their neighborhood. Stay tuned for more updates from our workplace giving program or find out how you can get involved here. There’s plenty of arts and entertainment events everyone can enjoy. If you don’t get our 7-Day Arts & Entertainment Forecast, sign up now. We’ll be posting our own “best bets” on this blog and telling you all about the arts and cultural events we’re attending for your own inspiration. Art can be enjoyed everywhere. Stay tuned for our interactive, online “arts breaks,” from videos highlighting our grant programs to instructions on how to fold origami post-it-notes at your desk. The money we raise through United Arts funds our range of grant programs; more than 75 cents of every donated dollar goes directly to the arts and heritage organizations we support. Follow us until we wrap-up our campaign on June 30, 2012—it’s going to be an exciting ride!